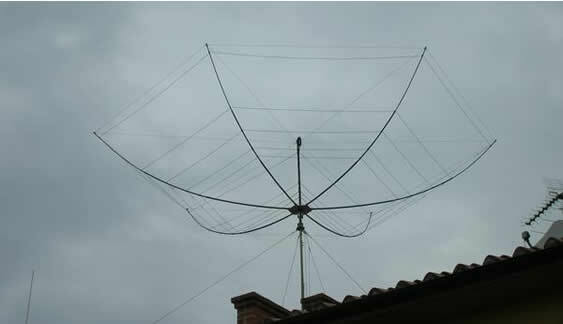 Which type of Antenna are you going to build? 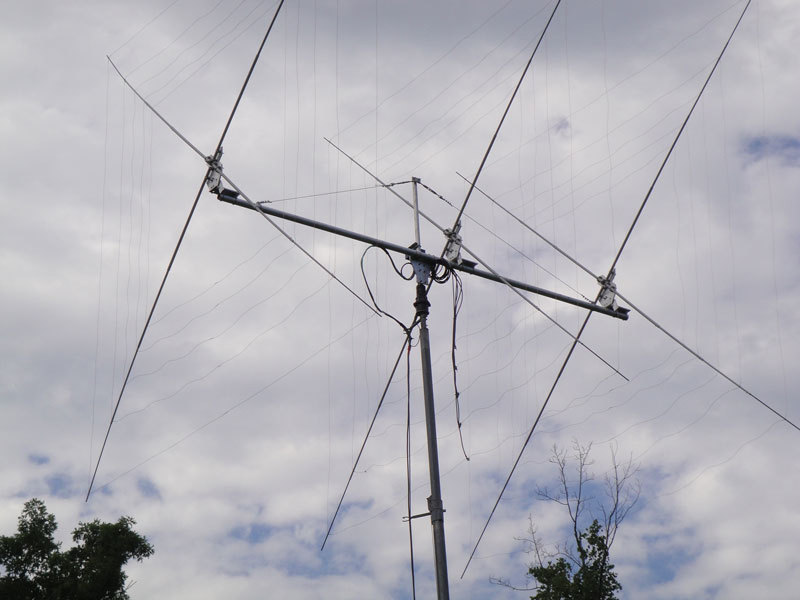 The hexbeam has been one of the most popular new antenna designs for amateur radio use in many years. An excellent performer, light, with a small turning radius and a relatively low visibility profile, this antenna lends itself to the “build-your-own” enthusiast. This page makes obtaining the needed fiberglass to build your own hexbeam an easy task, and also seeks to make the task of finding design and construction notes far easier, too! Before ordering the fiberglass for building your Hexbeam, you might want to look at these informational links. If you are aware of other useful / informative hexbeam links, please tell us so that we may make the link available to others. 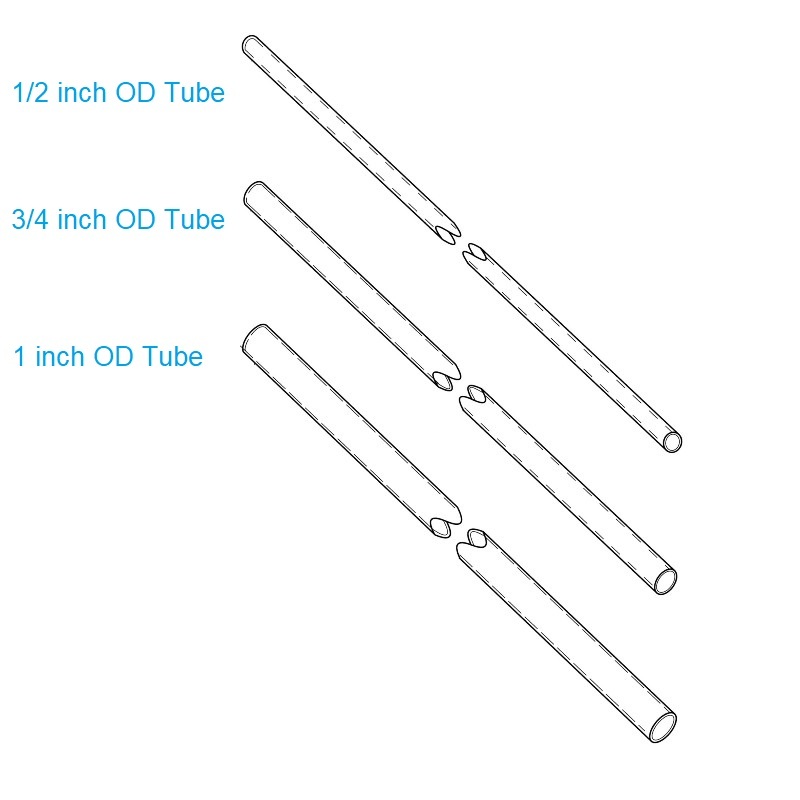 This Fiberglass Spreader kit is all of the fiberglass tubing will need in order to construct your own Hexbeam antenna. This is all the rope you would need to construct your own Hexbeam antenna. Consider one our 1000 foot spools if you are going to be using this as guy rope as well for the structure you will be putting your Hexbeam up on. Need to replace a single spreader? This kit makes it easy without buying extra parts that you don’t need. Max-Gain Systems offers several different types of Quad Spreader arms – up to 26 feet in length! Our wide line of fiberglass quad spreader arms allows our customers to select the ideal spreader arm for its intended role: lowest band desired, total number of bands, and the most severe weather conditions likely to be encountered in the customer’s location. You may design your quad with budget in mind, or to be “bulletproof”. In either case, our aim is to give you absolutely the most for your money. FedEx shippable. Available since the spreaders telescope at 8 feet… saving a great deal over the motor freight charges required for all one piece spreaders. Strength. Our design puts the larger diameter (and therefore the greatest strength) where you need it most: at the point of attachment to the boom. The ends of the spreaders are light-allowing flexibility, yet more than strong enough for severe conditions. Length. Since each spreader is made from eight foot sections, there is still up to 26 feet of usable length-even allowing an entire foot of overlap!!! 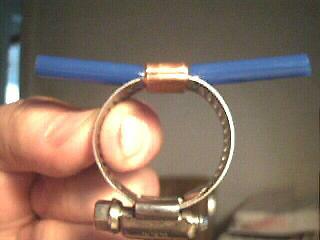 More than enough for a 40M reflector arm. Stress point reinforcement. 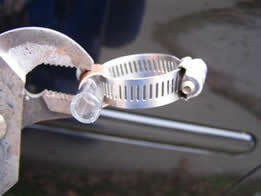 Some of the extra length can be used to reinforce the larger diameter with the smaller, at the point of highest stress: where the clamps secure the arms to the spreader mounting plate. This yields a full 1/4 inch wall thickness for most spreader types!!! 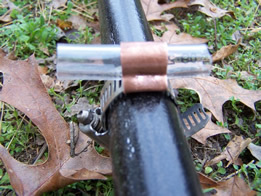 The following photos illustrate an easy method of making almost indestructible clamps to be used to attach element wires on quad antenna spreaders. This method does not require drilling through the spreaders. 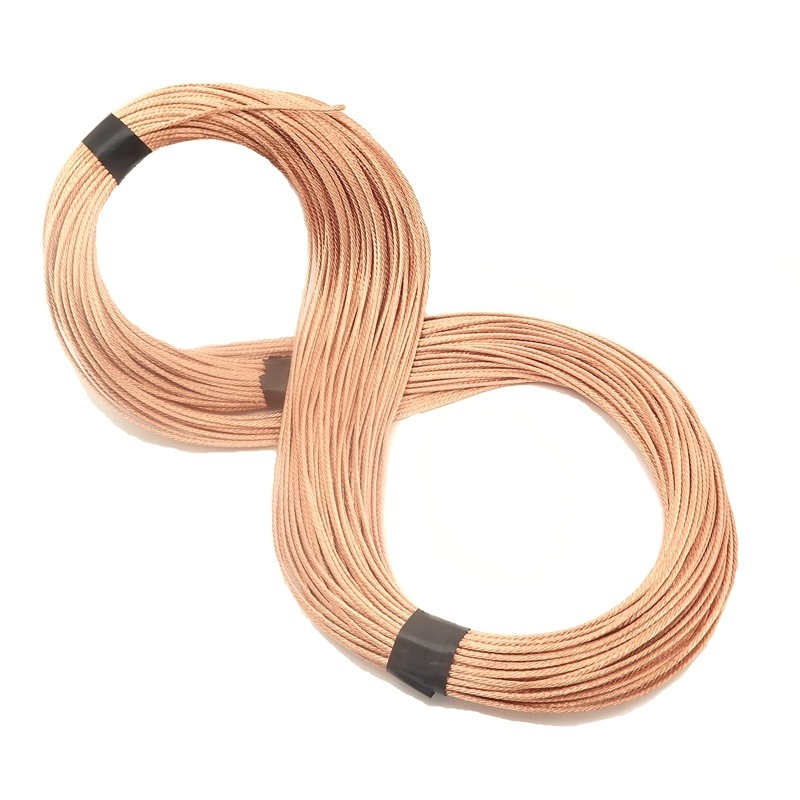 Allowing easy and infinite adjustment of the corners of the wire loops, for easy and precise loop centering on the element spreaders. 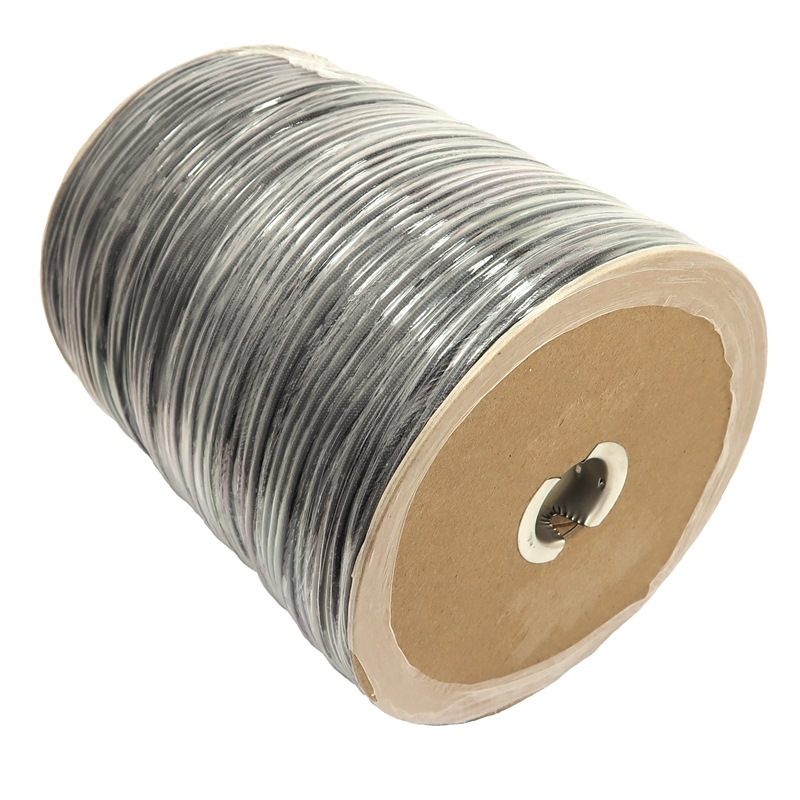 This method cushions and protects the wire elements at the points of greatest stress . 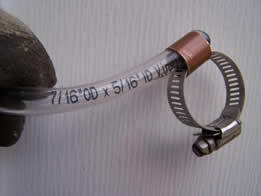 the loop corners, and prevents sharp bends which weaken the wire. 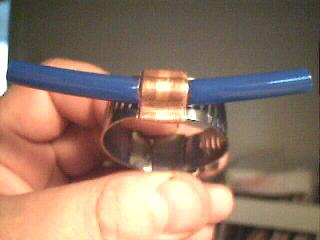 These clamps consist of an ALL STAINLESS hose screw-clamp.. (be certain the screw clamp says “All Stainless” or the screw itself will be plated, not stainless, and it will eventually rust), a short length of copper plumbing pipe, and a plastic tube. Very simple, but effective. 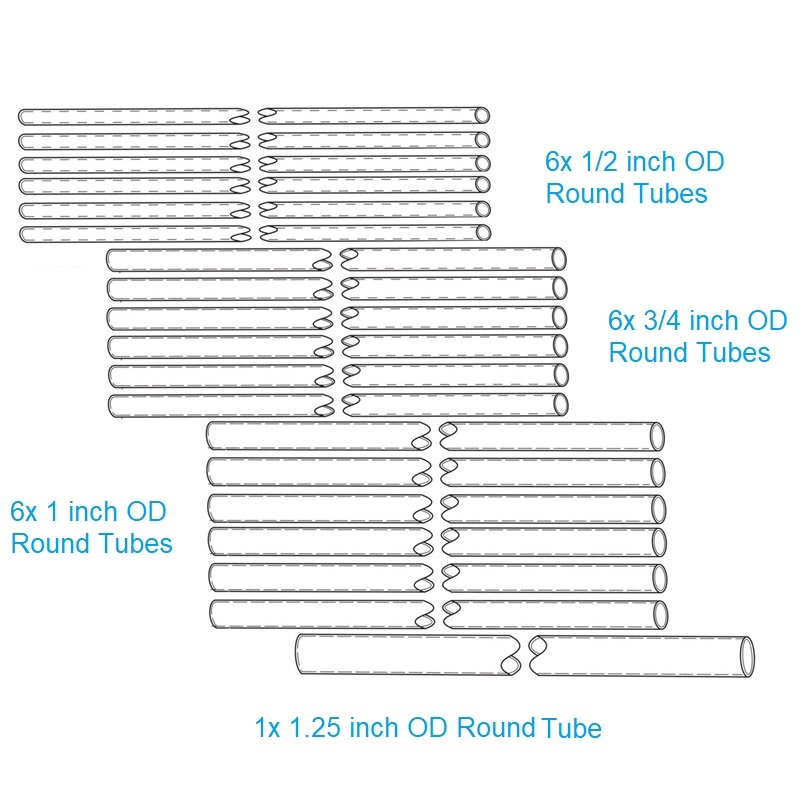 For the plastic tube, it is best to use a very tough and UV resistant material such as truck air-brake hose (from auto parts store) instead of clear vinyl tube. It will last MUCH longer. Also, spray-paint the plastic tube with flat-black spray paint for additional UV protection. 6 meters = 3.7 ft.
10 Meters = 6.6 ft.
11 meters = 6.9 ft.
12 Meters = 7.4 ft.
15 Meters = 8.8 ft.
17 Meters = 10.2 ft.
20 Meters = 13.1 ft.
30 Meters = 17.9 ft.
40 Meters = 25.9 ft.
Take the total wire length of the quad loop in feet (for example, 70.79 ft for a driven element on the 20 meter band) and divide it by 4…. (about 17.7 in our example). Then square the result…(about 313.3 in our example). Divide this figure by 2…. (about 156.65 for the example) and then take the square root. For our example, this yields the result 12.51, so you know that the wire intersect point will be 12.51 feet out the spreader, measured from the center of the boom. Simply take the cosine of one side of the quad loop (.707 times the length of one side of the quad loop) and measure out the sp reader (measure from the center of the boom) to determine the point of wire attachment! The measurement from corner to corner, measuring down one sp reader, through the boom, and up the opposite sp reader, (wire attachment point to wire attachment point) of each quad loop will be 1.414 times the length of one side of the quad loop.